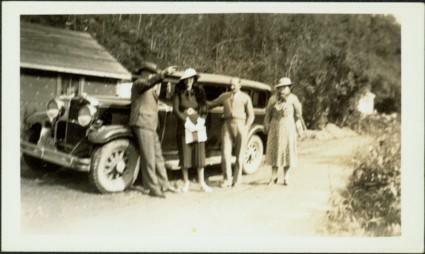 Photograph depicts a group of four adults standing in front of car parked on road. Forest and unknown building in background. Left to right: Judge Fisher, Mrs. [Laird? ], unidentified taxi driver, Sarah Glassey. Handwritten annotation on recto of photograph: "Sarah, The Taxi driver, Mrs. [Laird?] her husband is a Dr. at the University of B.C. I am very fond of her, and an old friend of yours Judge Fisher used to be just good old Billy Fisher." Photograph is one of 27 images comprising an album. Photos have been rehoused and original order maintained where possible; when unclear, arrangement has been imposed by archivist. Typed caption beside first photograph in album: "H.F. Glassey (Bert) Government Agent, Gold Commissioner, Coroner, Justice of Peace Atlin B.C. 1934 --- 1942." Item is part of the Taylor-Baxter Family Photograph Collection. See also items 2009.5.2.60 - 2009.5.2.86 for other photos originally included in album with this photograph. Album also includes an electoral registration certificate from the Dominion of Canada, railway passes, certification tickets from the Dominion Bureau of Statistics and the Wartime Prices and Trade Board, and membership cards of the Prince Rupert Liberal Association and the Society of Notaries Public.